This month, we meet entrepreneur and artist Georgina Daniel, who created her own small business and luxury wellness brand, t.&toff, this year. She’s the founder, creator, publicist, social media manager, accountant, creative director… and has a separate day job. So how does she do it? Tell us a little about what t.&toff is and why you decided to start it up? I am not even slightly good at the regular 9-5. I always knew I wanted to work for myself, so the idea came to me on a wintery morning last year as I was walking my puppy at 5:45am. I watched all these people commuting to work, taking the train or walking, and they all looked so miserable. I thought to myself: what motivates these people? Because I sure as heck do not want to go to work today! From then I started thinking about our everyday lifestyles, how much we work, how little time we spend at home or with our families, or time for ourselves. Life demands so much from us. So I came up with the idea to create a lifestyle brand that would prioritise wellbeing and help make relaxation part of the everyday routine. The ethos of t.&toff is to pair our natural bath tea with one of our hand-poured candles; to carve out a time to yourself and just be. Fleur[flower power]: soft florals of lavender, jasmine and juniper bath tea help soothe and relax. When burnt with our Pink Pepper & Patchouli candle, it creates a spicy boudoir. Extoll [rise, elevate]: feel uplifted with lemon, cardamom and tea tree infused bath tea. Burning alongside is our zesty, herbaceous and air cleansing Grapefruit & Rosemary bestselling candle, it will leave you feeling revived, regenerated and ready for the perfect night’s rest. Homme [it’s not just for boys]: smoky vetiver, clary sage and cinnamon – combines spice, earthiness and woodiness to alleviate muscle ache and relax. 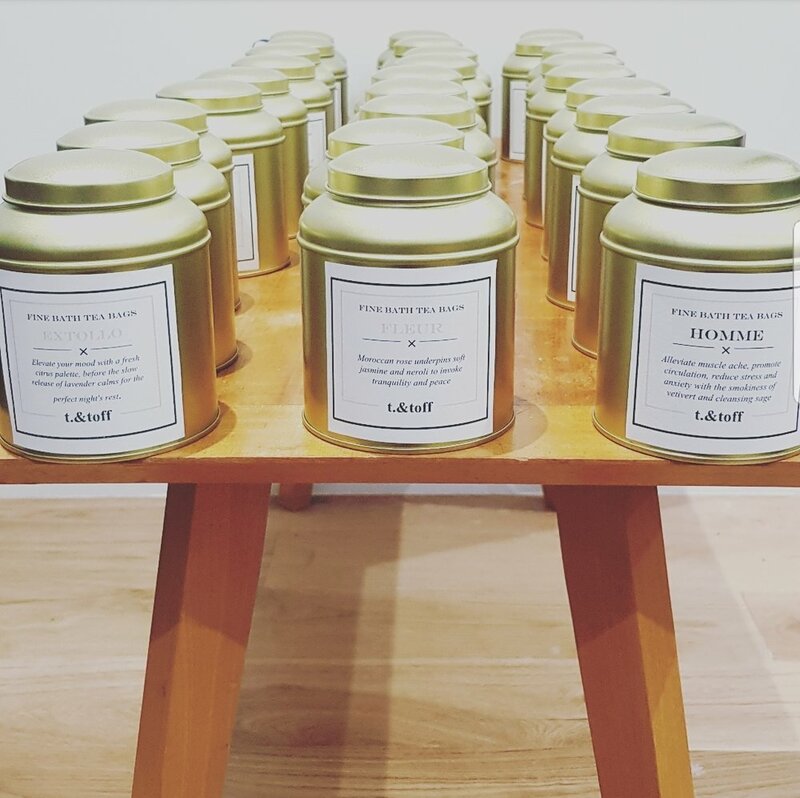 When teamed with our Sandalwood & Basil candle, you can create your own natural indoor haven. How did you learn about fragrance, what works and what doesn't? What has been your aim when creating these scents? Most of what I know is self-taught and through my own research. But having worked in the fragrance industry for over a year, being submerged with like-minded people has been so inspirational. Fragrance is so subjective, but like any industry, I guess it’s up to the creator to translate their stories and inspiration into art. Generally, like the structure of the colour wheel, fragrance works in a similar way. Typically a fragrance will be made up of a top note – often citrus, the most volatile particles that evaporate quickest. The middle – florals, greens – you’ll notice next, and this then leads to the base notes – woods and musks, the longest lasting part of the fragrance. When creating my fragrance combinations I wanted to create something that was natural, powerful, fresh and ‘trendy’ but had to make sure every component was relevant in the relaxation process. Every aspect of each range is designed to work together. Minimalism is key. We love that your scents aren't predictable, but they still manage to work so beautifully. Can you tell us what you're bringing out for Christmas, and why these scents? Traditionally, Christmas fragrances tend to be spiced, heavy and sickly gourmand. I wanted to create something modern, elegant, and with a splash of tradition for t.&toff. So I created a new Amber & Pine candle, wrapped in frosted white glass with a grey velvet ribbon. I wanted to show the juxtaposition of a crisp ‘white Christmas’ on the outside, with the warmth and tradition of a Christmas tree on the inside. Pine offers a fresh, crisp note reminiscent of a Norwegian pine. Amber adds warmth and sweetness, whilst Frankincense adds spice to invoke nostalgia, tradition and luxury. It’s probably my favourite candle I’ve made so far. What's it been like running a small business 'on the side', on top of your day job? How do you find the time to make the products and market, and have there been any challenges between what you want artistically and what you can achieve from a business sense? Stressful and tiring, but it gives me purpose, focus and is so rewarding. If anything, my day to day job is what gives me the drive to make t.&toff more successful. I am always working on t.&toff, in the morning before work, during lunchtime, after work, weekends, when I’m driving and even when I’m trying to sleep. I’m constantly brainstorming: new ingredients, new fragrance concepts, and what my next move should be. To be honest it doesn’t feel like work, because I love it. It’s just become a part of me now. I think the worst thing is seeing something in your head and not being able to translate it into an actual product. A huge trend next year is ceramic packaging, and I can see the t.&toff version in my head, but I cannot find the materials in real life (yet!). Honestly, when people give me positive feedback – it is invaluable, people believing in me is the best encouragement I could ask for. I also have the most amazing support network around me, who encourage me when I’m tired and feel like giving up. Without them, t.&toff wouldn’t be here. Whenever I smell a fragrance, I feel inspired – to interpret perfumers journey/creation is incredible. I ounce smelt a potato fragrance, which was, as you can imagine, wonderfully weird, and once the potato top note had evaporated it was actually a lovely mellow and soft fragrance. The perfumer created it because cooking was her passion; she was cooking a main course with potatoes and desert with vanilla and wanted to turn both those scents into a fragrance. It’s incredible that fragrance is in every corner of our lives, more than we realise. What advice would you give other women when it comes to starting up their own business, both creatively and financially? Stop planning and do! If you know what you want to do then just do it. I spent nearly two years perfecting the same business plan – why? I knew what I wanted to achieve but was just procrastinating by not putting this plan into action. Be consistent, even if you only do one small thing a day – it makes a difference. And also, be prepared to make some sacrifices and learn how to balance your time. It will pay off in the end – and in the meantime, don’t be too hard on yourself.